Japanese arcade title Tatsunoko vs. Capcom is getting a console release — a Wii console release. On December 11th, the game is slated to come out in Japan. The game pits Capcom characters against Tatsunoko anime characters. 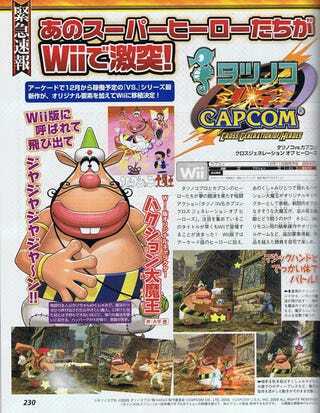 The Wii version will feature an original challenger: Tatsunoko anime sneezing genie Hakushon Daimaou. Interesting to note that Tatsunoko is handling the character endings. The game is currently 70 percent done, and the Wii version will have more fighters. The arcade version should be out in December as well. Thanks MarkMan!